Educational Qualification : Passed High School Exam with minimum 50% marks(SC/ST- 45% Marks) from any Recognized Board and ITI Certificate in Relevant Trade with minimum 60% marks. Eligible Candidates can Submit Application at the Official Address of UCIL latest by 30th October 2018. 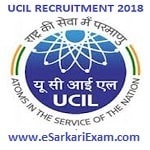 Applicants First Logon to UCIL Official Website. Open Jobs Link at Home Page. Click on ITI Apprenticeship Enrollment Advt. 02 & 03-2018 for 2018-19. Take Print out of Application Format. Fill up Application Form and Send it Along with All Required Documents and Certificates to the Official Address. Application Should Reached Latest by 30th Oct 2018 to the Given Address by Speed Post. UCIL Jharkhand Address : Dy. General Manager (Inst./Pers. &IRs), Uranium Corporation of India Limited, PO- Jaduguda Mines, Dist- East Singhbhum, Jharkhand - 832102. The General Manager (Mines-AP), Uranium Corporation of India Limited, Tummalapalle, PO- Mabbuchintalapalle, Dist- YSR Kadapa, Andhra Pradesh - 516349.